What: A hearty soup that both and kids and grownups will enjoy, and a great way to get a hefty serving of veggies, specifically, cauliflower. When: This takes a bit of time to prepare (45 min to an hour) but the investment is worth it because it will feed your little one for weeks or make about five hearty adult servings. It’s a great fall or winter soup when you’re in the mood for something healthy, filling and comforting. Why: The dreaded moment has arrived… the toddler vegetable boycott. My son had been avoiding all veggies for two weeks now (except those cooked into his favorite turkey burgers) and, frankly, it was driving me nuts. 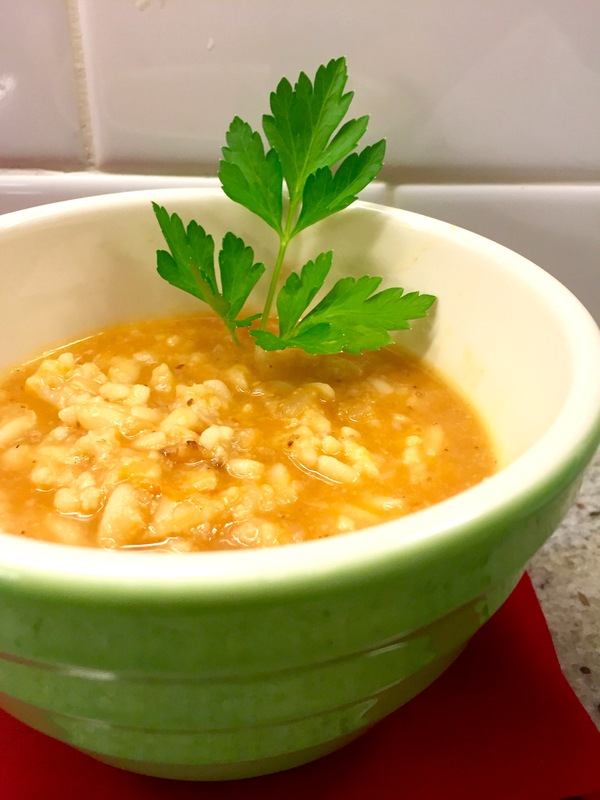 I happened to make this soup for my husband and I and, wouldn’t you know, my son cannot get enough of it! Ban lifted! And I plan to stuff him full of veggies as I ride out this fussy stage as long as I can. Because my baby has happily gobbled down multiple helpings of this soup three or four times now (as have I! ), I knew I just had to share it with you. How: Make this on a lazy Sunday when you have about an hour to spare. Line up the tupperware as this freezes well. It’s even tasty at room temp. Enjoy! Recommended equipment: An immersion blender – optional. A hand masher for potatoes would work well too. In a large pot, heat the Olive Oil over medium-high flame until hot. Add the Cauliflower and cook, stirring frequently, until the Cauliflower begins to brown and become tender, about 10 minutes. Add the Garlic, Bay Leaves and Crushed Red Pepper Flakes. Cook another 5 minutes, stirring frequently. Next add the Chicken Broth and Strained Tomatoes, stir well and bring to a boil. Reduce the heat to a simmer and allow to cook another 25 minutes until Cauliflower is very tender. Add some water back to the pot to bring the liquid level back up to where it was when you began simmering. Add the Vinegar and then season to taste with Salt and Pepper. Bring to a boil again. Add the Orzo and cook about 9 minutes on a low boil until it becomes tender. (If you’d like to sub in another small pasta that is fine, just cook on a low boil in the soup as long as the package recommends. Test the pasta and cook longer if needed). The soup should be about as thick as porridge. You can loosen it with additional water if you like. Turn off the heat and optionally blend just a bit using an immersion blender, ideally leaving a good amount of texture but a thicker, creamier quality. I like it when some of the Cauliflower florets are left intact, but do blend to whatever consistency your little one prefers . You can achieve something similar using a potato masher too! Serve right away!